Roulette has always been attracting the casino enthusiasts, who are looking to score big. 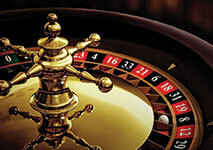 The reason is that roulette is a game, which provides high payouts. But this is a game, in which not only the house has an edge, but also the luck has a fair share. The reason is that when the croupier tosses the ball, there is no strategy, which can control it. If you ask anybody to name one casino game, that would be most probably roulette. The actual spinning device is a wheel, which consists of divisions, also called pockets. The whole structure has become so iconic to the game, that even those who have never been in a casino know the game pretty well. In fact, the rules are easy and that is why the game has gained such a great popularity all over the world and even online. Nowadays, there are many people, who even prefer to play it online, instead the traditional land-based variation. In that way, they can focus on their strategy and betting system, without being bothered by all the noise. The main objective of every roulette player is to place the right bet and make the right guess, so that they will get a return. Thus, the players place their chips down on the betting layout of the table, expecting the dealer to announce the winning number. As we already mentioned above, to calculate your profit, you need to know the table, which you are playing on and its specific rules. Although roulette is governed by similar rules, there are some differences, which affect the odds and payouts. To better understand the notion of odds calculations, it is crucial that one realizes that there are three different types of roulette games with two different wheels. In fact, at its core the game is of French origin, but it was developed in 2 more variants – European and American. French and European roulette share almost the same rules with the same wheel. But Americans love changes, especially when in favor of the house. When the game was first introduced to the American gambling community, casino managers did not like the idea of the low profit to the house. In an attempt to increase it, they have added the double-zero pocket, which boosts the house edge to 5.26%. Unlike the American variation, the European one provides only a single-zero pocket, which is absolutely advantageous to the player. With the low house edge (only 2.70%) and the better chance to win, players prefer the European and French tables. Before starting to play roulette, you need to be familiar with two terms – “odds” and “probability”. Since we mentioned already that this game is based on luck, you need to calculate what exactly are your chances to win a particular bet. These two terms are related to percentages, which will give you a better notion on the possible wins and losses. Before applying the term in the casino game, we would like to make it clearer with a simpler example from life. We all know the flip-a-coin game, where the chances to win are just the same as to lose. The coin has two sides, which represent two different outcomes – heads or tails. For instance, you bet on head outcome and you are expecting that particular result, or in other words you choose one out of two possibilities in total. Thus, we may say that the “probability” to win is 1 out of 2 possible. This ratio can be also expressed as 1 to 2, 1:2 or ½. Based on that ground, it is safe to allege that the “probability” term is related to two numbers. The first one shows the possible chances for the particular event to occur and the second one – all possible chances in total (both for win or loss). These can be also converted in percentages by dividing the first number by the second, and multiplying it by 100. If we acquire the first number as an unknown X and the second – as an unknown Y, we may come up with the following formula: X / Y × 100. In our case, we have 1 / 2 = 0.5 × 100 = 50%. So, the “probability” for heads to win is 50%. Another example can be given with the die. It has 6 sides in total with different numbers on each side. So, the chance for a particular number to come is 1 out of 6 (in total). When expressed in percentages, it will look as follows: 1 / 6 = 0.17 X 100 = 17%. In a nutshell, the term refers to the number of possible cases, which are favorable to the player. Now, it is time to put the knowledge into practice. With the European and French wheel, we have 37 numbers and you place your bet on one number (straight-up bet). To calculate the possibility for your “lucky” number to show, you need to divide 1 chance of win by all 37 possible ones. Briefly, this means 1 / 37 = 0.027 X 100 = 2.70%. Let’s explore the situation with placing a bet on 2 numbers. You have 2 possible chances to win out of 37 in total. Talking in percentages, this equals 5.4%, so a better chance to win. It is a well-known fact that the American roulette table is disadvantageous to the player. But this concept may appear to be incomprehensible to an amateur gambler. This article will explore the reason why it is better to avoid the American table. On the American wheel, you will spot 38 pockets in total. To compare the percentage of probability in both variations, we will give examples with the same bets as in European roulette. You place your bet on one number and you have only 1 chance to win out of 38 (37 chances to lose, plus 1 to win). Expressed in percentages, it means 1 / 38 = 0.026 X 100 = 2.63%. If the player decides to place a bet on 2 numbers, then the following situation is in effect: 2 / 38 = 0.053 X 100 = 5.30%. Many people consider that “odds” and “probability” are the same, but that is not the case. There is a slight, but essential difference between these two. The odds represent the possibility of a particular event to happen as opposed to the possibility of the same event not to occur. Similar to the probabilities, odds are also represented by two numbers. The first number reflects the possibility of the occurrence of the particular event (exactly the same as the function of the first number in “probability”). The difference between the two terms comes from the second number. With odds, the second number represents all the other possible outcomes, excluding the winning one. With the flip-a-coin situation, the possible result is only one, since only one side of the coin will show up. So, we may safely say that the odds of a heads to win is 1 to 1, or 1:1. What is also another significant difference is that the odds are also represented as ratios and never as percentages. If we look back at our example with the straight-up bet, the odds with the European variation are 1 to 36 (1 possibility to win and 36 to lose). On the other hand, the odds of a straight-up bet on the American table is 1 to 37, or the odds for winning are 1:37. In fact, it should be mentioned that there is a slight difference between the odds. There are odds for and odds against. When the numbers are everything but even, the difference is quite tangible. Every seasoned player has no problem to make the distinction between “odds for winning are 1:2” and “odds against winning are 2:1”. The payout is always higher, when the chances for winning are lower. For example, you place a straight-up bet, which means you place your bet only on one particular number out of 38 possibilities (for the American roulette). Thus, your chances to win are 1 to 37 or 1:37, i.e. the odds for winning are 1 to 37 and the odds against winning are 37 to 1. But if you win the bet, you will get a 35:1 payout, because of the profit of the casino, also known as the house edge. If you place an even-money bet, like red/black, then the chances to win are 18 against 20 possible chances to lose (18 black numbers plus 2 green zero-numbered pockets). Therefore, the odds for winning are 18:20. The payout, though, is 18:18, because the house takes 2-unit profit (1 for each zero-numbered pocket). The same is valid for the even/odd bets, because zero as a number is neither even, nor odd. If you place your bet on even numbers, you have 18 chances to win and 20 to lose (the odd numbers and the two zeroes). Thus, the odds for winning are 18 against 20 possible ways to lose. But the payout is again 18:18 after the house takes its 2-unit profit. The house edge is the profit of the casino, which is determined by the presence of the zero-numbered pocket(s). That is the reason why in the American variation of the game, the house edge is higher than in the European one. The presence of the second zero pocket increases the chances for the player to lose. The house edge is calculated in a very logical way, in fact. It is not just a random number, figured out by the casino managers. With double-zero pocket, the chances of the casino (against all the bets on the table) are 2 to 38, which is equivalent to 0.0526. To represent it in percentages, it means that the house edge is 0.0526 X 100 = 5.26%. With the European and French variations of the game, the logic is the same. With only one single zero-numbered pocket, the chance of the house to gain the upper hand over all the players is only one. Consequently, we have 1 to 37, which is 0.027 or 2.70%. To put it in an example, if you place a straight-up bet on American roulette, the probabilities for the player to win are 1 to 38, the odds are 1 to 37 and the payout is 35 to 1 (after the house gains its edge). To know how to calculate your possible win or loss is the core strategy of roulette. Many gamblers are entrapped by the so-called gambler’s fallacy. They believe that the long consecutive streaks of one winning number or group of numbers is very rare. For example, if the winning number was three times in the red section, it is not necessarily that on the next spin the winning number will be black. This is a game of chance and the players cannot be sure that a particular number or event will show up on the next spin. That is why the best strategy in roulette is to keep track of your bankroll and protect your bank account from bankruptcy.